The saying, “Don’t lose sight of the forest for the trees” may take on a special meaning for Kevin Harvick and the No. 4 Ford team for Stewart-Haas Racing (SHR) this week as the Monster Energy NASCAR Cup Series heads to Dover (Del.) International Speedway for Sunday’s Gander Outdoors 400 to kick off the Round of 12 in the NASCAR playoffs. Winning the first race in the Round of 12 at Dover is the immediate focus, but the big picture remains the 2018 NASCAR Cup Series Championship. This weekend at Dover, Harvick will drive the No. 4 Busch Outdoors Ford Fusion in support of the National Forest Foundation. The foundation promotes the health and well-being of 193 million acres of public lands that people use every day to hunt, fish, camp and enjoy nature. For every lap Harvick leads at Dover, Busch Beer will donate $1,000 to the National Forest Foundation up to $25,000. 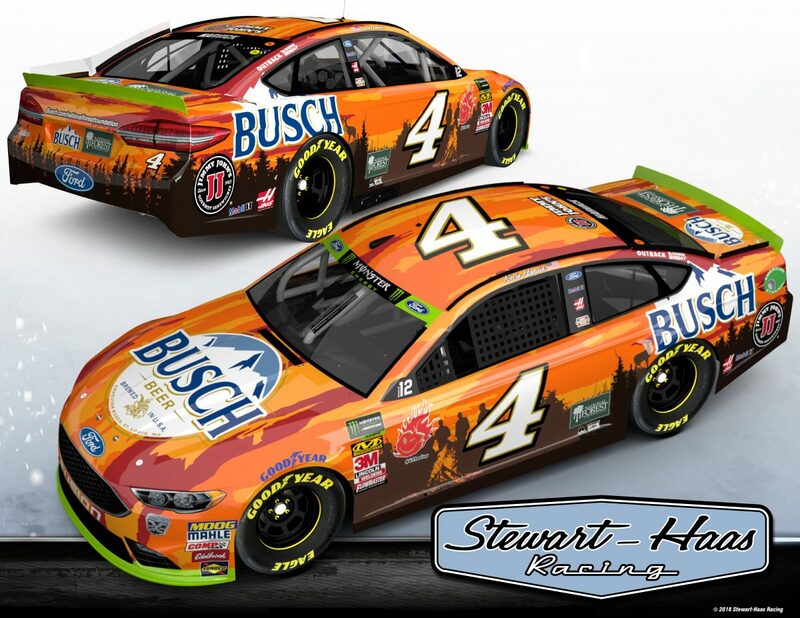 Each dollar donated is approximately equivalent to one tree being planted in a national forest, so if Harvick were to lead 25 laps at Dover, Busch Beer would be donating approximately 25,000 trees to national forest lands. The partnership is a natural move for Busch. The National Forest Foundation works tirelessly to protect healthy forests and watersheds across the country, which not only preserves their use for the public, but also contributes to high-quality beer by protecting sources of fresh, clean water – a crucial ingredient in the brewing process. Harvick and the No. 4 Busch Outdoors team should hold up their end of the deal this weekend if recent history is any indication. Since joining SHR in 2014, Harvick and the No. 4 team have led 1,011 laps in the past nine Cup Series races at Dover’s concrete mile oval. The team has also scored two wins, one pole, three top-five finishes and four top-10s there. In addition to his outstanding performance history at Dover, the 2014 NASCAR Cup Series champion is the series leader with seven points-paying wins, 20 top-five finishes, 23 top-10s and 1,274 laps led. Harvick is now second in the playoff standings with 3,050 points, 42 ahead of the final transfer position as he heads to the first race in the Round of 12. A win at Dover would mean he automatically qualifies for the Round of 8, but additional stage wins and race wins mean extra playoff points as he progresses through the playoffs. For the No. 4 team, the focus this weekend is on the trees – starting up front, leading laps, winning stages and winning the race – but with the big-picture forest in mind of advancing to the next round of the NASCAR playoffs and winning a second championship. Whether focusing on the challenge directly ahead or the big-picture goal, Harvick and his team are going to be trying to build a forest one tree at a time starting this weekend in Dover. Who is the man to beat at Dover these days? Describe what it’s like to take a lap around Dover.